After the Thanksgiving decorating blitz, this week has become Christmas detail week and lists are flying! Things to do, things to get, things to make and the everyday chores as well. In the midst of all of this, the reality of everyday life kicks in. There are friends to talk to, support to give to grieving friends with lost loved ones and those asking for prayers for medical tests, recovery and the unknown. This week we work on the final touches to our home that makes it uniquely ours and welcoming to all of our friends and family who come to see us. This week the Snowflakes my mom carefully has crocheted for decades and given to all her friends and especially her family and starched them to a crisp flat beauty were finally found. This are a constant in our holiday decorating and one that we treasure. With mom’s recent stroke, we may not get these again in years to come so these precious treasures were extra special this year as we may not receive them in the coming years. A legacy purely my mom’s. In addition to the final touches inside we begin our outdoor décor. This year I wanted an all natural feel and back to nature. I wanted décor that reminds people that we live in the country and I did not want to spend a fortune achieving the look. Sam’s Club had large rolls of beautiful country charm ribbon and I snatched up several beautiful rolls that matched our home and the look we are comfortable with. The Ranger full of greens, I set out to begin the decorating process. 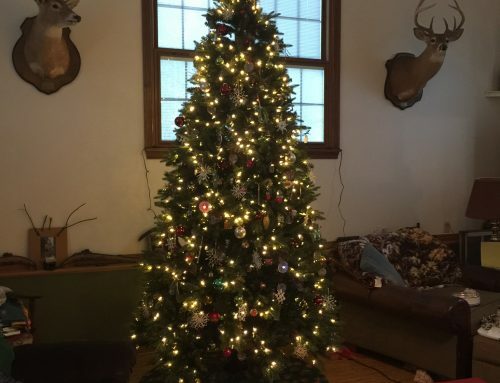 Creating the big bows and putting the look together, my guys and I are satisfied that we are comfortable and the look we will come home to every evening will be most welcoming. If it’s welcoming to us, it will certainly be welcoming to our family, friends and holiday guests. Putting together bows for our interior decorating comes next, adding bows and greenery here and there, we look to make a décor that is both inviting as well as economical and not overdone. Each year our employees come to our home to enjoy a day together before the annual week off between Christmas and New Years. We want our home to show them who we really are. We aren’t ostentatious or dripping in money, we are ordinary, just like they are. We aren’t putting on a show, but rather putting on our best and most comfortable. This week will bring lots of events and demands, including our youngest son’s birthday. December birthdays are such a challenge as we want to make his birthday super special but also uniquely his special day. This weekend is also a birthday cooking and planning weekend for our special loved one. Each year this is a huge challenge and one that we uniquely work through successfully! So in the midst of holiday decorating we are making birthday cakes or cookies and planning a special dinner out at the birthday boy’s restaurant of choice. As we wind up this weekend, we want to be able to have all the decorating things and containers put back away and begin to spend the next three weeks celebrating the season, contemplating the celebration of the birth of Jesus and preparing for the New Year. Watch for next week’s edition as we begin the work of the last minute baking, edible food recipes and preparing for the fruit distribution to employees and friends from our Dinwiddie Future Farmers of America (FFA) Fundraiser. Make is special this year! Give a piece of yourself in all you do. What is it that makes you uniquely you? Take a minute to share that piece of you with all those around you this Christmas.